For several decades, those inventing, manufacturing, installing, maintaining and using machinery -- including elevators -- seldom envisioned the various types and systems without leather belts linking steam or gas power sources to reduction gearing. Belts were the primary means of transmitting power -- whether in a central distribution source or on-site -- an engineering necessity. The familiar connecting device could be constructed in layers, patched and quickly replaced. Belts were even used in lieu of hoist ropes. 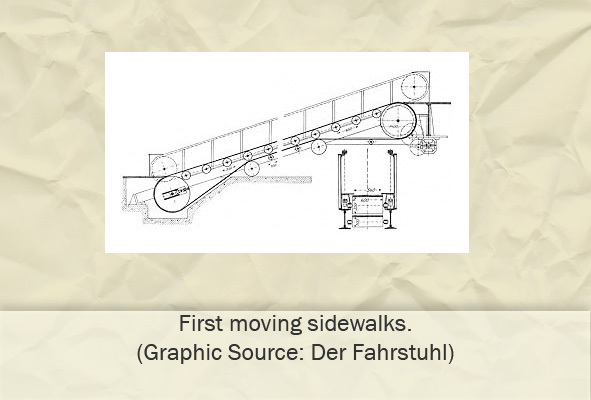 When the need arose to continuously move sand, grain, coal and other raw materials, over distances, engineers turned to wider belts, guided over rollers and driven by steam, gas or electricity. Could this old favorite workhorse -- the belt conveyor -- move people safely, comfortably and efficiently? The first exhibit in this Gallery indicates that indeed it was a coal company that contracted to build and install a multiple-belt system at the 1893 Chicago World's Columbian Exposition. Although the bulk-transporting manufacturer had considered a set of five belts, moving at different speeds, three were finally used in the transfer process. Hand holds were the order of the day and once on the final panoramic belt, passengers could sit down and regain their composure! 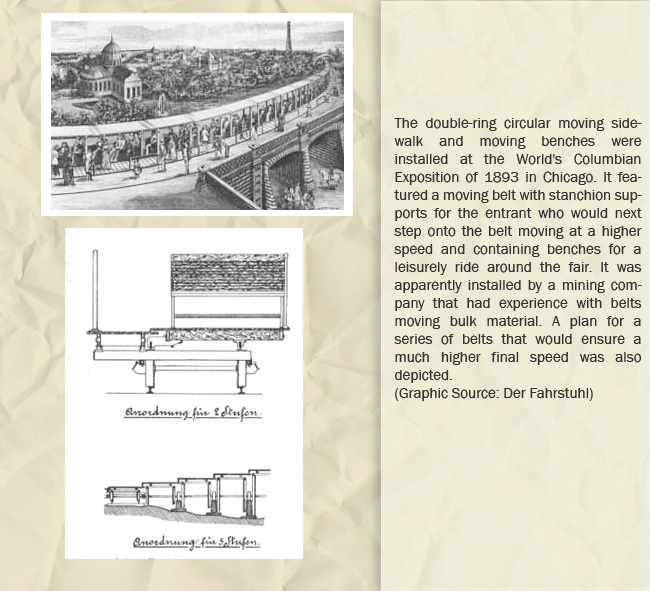 However, it was the escalator that grabbed the attention of companies in the business of moving people short distances. Metal escalator steps could be ridged and "combed" as they disappeared under terminal plates. Ridges were also molded into rubber belts. The escalator steps provided a solid platform of wood or metal. The belt could be undergirded with a steel slider bed or closely placed rollers. (The latter offered a sensation of unease along with rippling foot massages!) 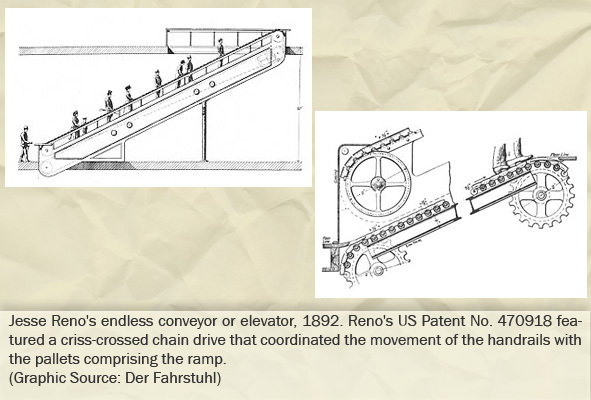 Inventors and large elevator manufacturers focused their experimentation upon the moving stairways/escalators that could serve steeper inclines than the ramp. 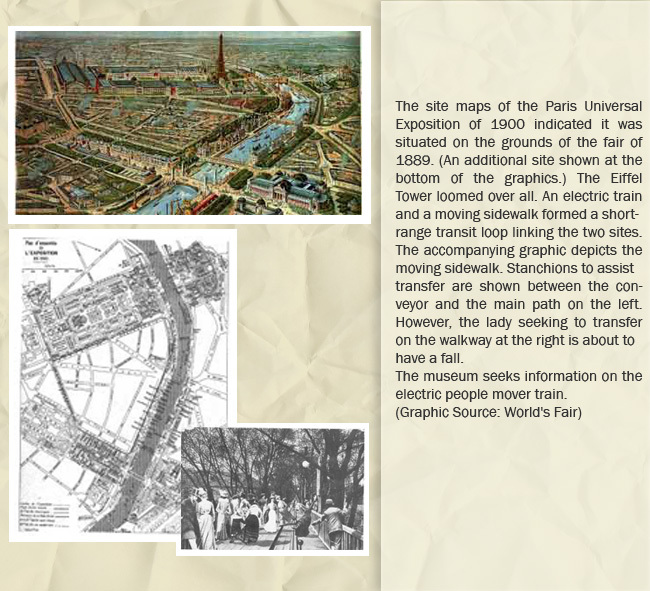 The moving sidewalks and ramps brought up the rear, primarily making a statement at exposition or museum exhibits where management wished to assure that viewers moved along slowly and steadily without "bunching." The passenger conveyor was to eventually find a place in modern airports where long distance had to be traversed, often with luggage. In such applications, the escalator metal stair steps did double duty and replaced the belt. The coordinated handrail and virtually all safety devices were also transferred to the escalator's horizontal sister. Belts -- going back to their success in materials-handling days -- eventually found a niche as ramps in low but multi-leveled stores where shoppers might wish to take their carts from floor to floor. The belts were constructed to grip the cart wheels and provide an assist to shoppers. It was back to Square One! On the other hand, moving stairways continued to struggle with the problem of moving luggage carts safely and efficiently between airport levels.